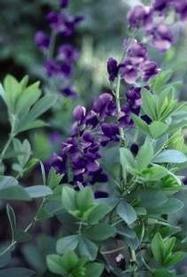 Blue False Indigo, also known as Redneck Lupine, has blue pea-like flowers in May and June, A long-lived perennial. 2010 Perennial Plant of the Year. All Baptisias are very roadside salt tolerant and dry site tolerant. PRN Preferred: Easy to grow and does not grow too big. 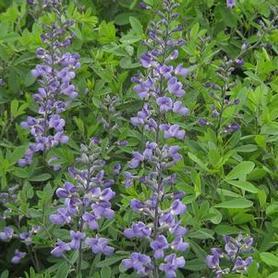 'Indigo Spires' False Indigo flowers in May and June, producing 12-15" showy spikes of deep violet pea-shaped blooms. The green stems are very sturdy so the flowers are held upright above the clumps. 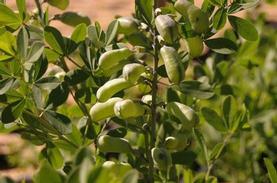 Baptisias have deep taproots and become almost shrub-like in size as they mature. 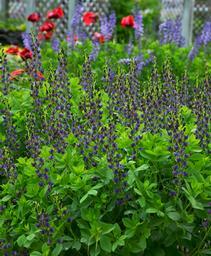 Baptisia 'Indigo Spires' is very tolerant of both dry sites and road salt. A Walters Gardens introduction. 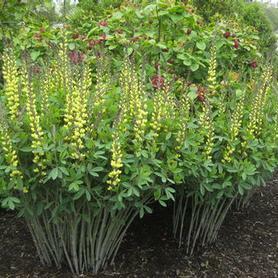 'Blue Towers' False Indigo is an exciting introduction from Plant Delights Nursery, resulting from their cross of Baptisia australis x Baptisia alba. The tall showy spikes are covered with bluish purple pea-shaped flowers in May and June. The habit is upright with 20" long flower spikes. Baptisias are very hardy, long lived perennials with the added advantage of being both native and deer resistant. 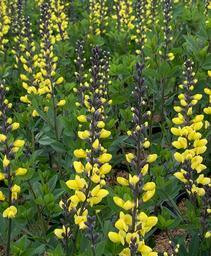 'Carolina Moonlight' False Indigo has buttery yellow pea-shaped flowers in June over clean, bluish green foliage. A great long lived hybrid from Rob Gardner of the NC Botanical Garden in Chapel Hill. Decedence® 'Lemon Meringue' is a new introduction from Hans Hansen's extensive breeding program. The lemon yellow pea-shaped flowers are held on tall charcoal colored stems above bluish green foliage. A tough, long lived native perennial, Baptisia 'Lemon Meringue' is a colorful addition to the back of perennial borders as well as an excellent candidate for prairie gardens and dry meadows. Decadence® Lemon Meringue is drought tolerant, deer resistant and long blooming. 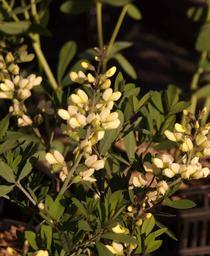 Decadence® 'Vanilla Cream' False Indigo has 10" spikes of vanilla pea-shaped flowers in May and June. The petioles are dark gray, making an attractive contrast to the opening flowers. The clean disease free foliage matures to grayish green in summer, making a wide clump topped by dark charcoal round seedheads. Baptisias are very long lived perennials and are useful in the back of mixed borders as well as in meadows. From Hans Hansen's Decadence® series. 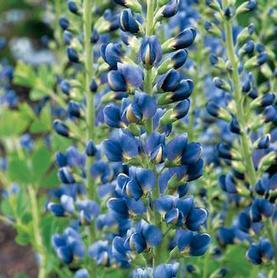 Midnight Prairieblues™ False Indigo has very long spike of deep bluish violet pea-shaped flowers on large, vase-shaped plants. The blooming period covers 3 to 4 weeks because of the secondary flowers which follow the long primary blooming stems. Baptisia Midnight Prairieblues™ is another extremely hardy beauty from the extensive work of Dr.Jim Ault and Chicagoland Grows®. The drought tolerance and long life of Baptisias are hard to beat in the perennial world. 'Purple Smoke' False Indigo has bluish purple flowers in May and June. A long lived perennial, selected as a chance seedling by Bob Gardner of the NC Botanical Garden. We love the subtlety of the flower color, as well as the clean, shorter foliage. One of the native plants chosen by Piet Oudolf for the newly planted meadow garden at Delaware Botanic Gardens. PRN Preferred: A slightly shorter variety. Very drought tolerant once established, subdued bluish flowers work well in a perennial garden. 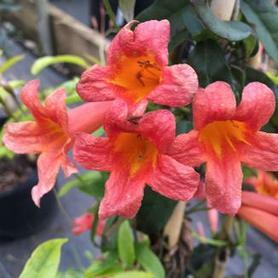 'Tangerine Dream' Crossvine was a favorite of the late great Dr JC Raulston, who was largely responsible for bringing this beautiful vine into prominence. The large tubular flowers have showy open faces and are produced in great quantities in May and June. The color is a spectacular combination of tangerine and ruby red with yellow throats. Some reblooming happens sporadically, and the flowers are followed by interesting green pendant pods. The foliage turns shades of bronze in fall, and often remains attractive for most of the winter. Bignonia capreolata 'Tangerine Dream' is better behaved in size than most Campsis. Hardy Orchid has rosy purple flowers in May, like miniature Cattleyas. 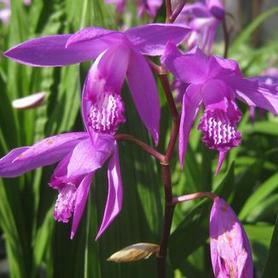 The clump will grow steadily larger, and Bletilla is dry site tolerant when established. Best planted in spring or early summer. Variegated Hardy Orchid blooms in May, producing rosy purple flowers that look like small delicate cattleyas. The flowers persist for several weeks, and Bletilla striata 'Variegata' continues to add interest to the garden because of the thin white stripes on the broad tropical looking leaves. Hardy Orchids grow to make good sized clumps in shady location. They remind us of Prom corsages for pixies. 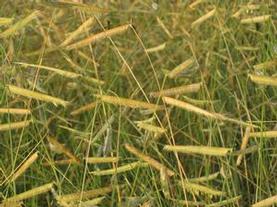 'Blonde Ambition' Blue Grama is a lovely low maintenance native grass which has unusually shaped inflorescences. The orange to straw colored flowers are held horizontally off the stems, so that they look like tiny feathers. This is especially lovely when back lit by afternoon sun. When planted in mass, Bouteloua 'Blonde Ambition' can serve as an infrequently mowed lawn, since it does best in full sun. It was introduced by David Salman of High Country Gardens, and brought to our attention by Steve Castorani of North Creek Nurseries. PRN Preferred: A fun whimsy appeal, what other grass has horizontal seedhead that last well into the winter? 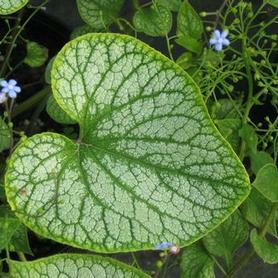 Heartleaf Brunnera has blue flowers in mid April to June over green foliage. Must have a moist spot. A slow spreader. 'Jack Frost' Heartleaf Brunnera has blue flowers in mid to late spring. The green foliage has a showy silver overlay. Cool shady conditions are best. 2012 Perennial Plant of the Year, introduced by Walters Gardens. 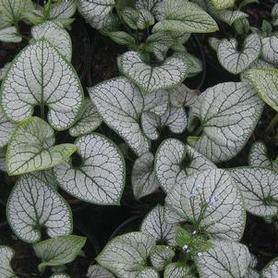 'Sea Heart' Heartlef Brunnera has green foliage which is largely overlaid with beautiful silver netting, leaving only green veins for contrast. The flowers are held above the leaves in April and May. They open lavender pink and mature to clear blue, looking just like Forget-Me-Nots. 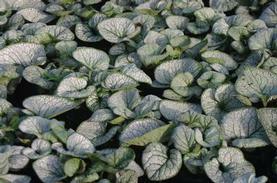 The extra advantage of this new Brunnera from Holland is that its foliage is significantly sturdier than other silver varieties, enabling 'Sea Heart' to stand up to Eastern heat and humidity better. Bred by Spitzbergen Willemsen and introduced into the US by Plants Nouveau. 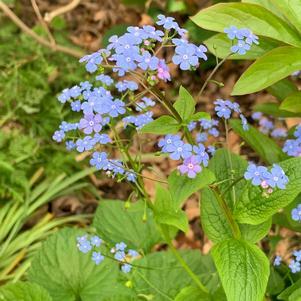 'Silver Heart' Heartleaf Brunnera blooms in April and May, with cobalt blue flowers held over stunning silver and green heart-shaped leaves. The leaves are similar to the other new silver-laced cultivars but Brunnera 'Silver Heart' has thicker, more pubescent foliage, so it tolerates our hot East Coast summers better. All Brunneras perform best with moderate but consistent moisture, and the effect of the large blue flowers over the silver foliage is spectacular in the spring. PRN Preferred: Better, more heat resistant foliage for our East Coast summer conditions. 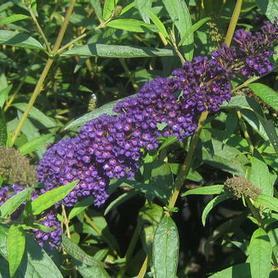 'Black Knight' Butterfly Bush boasts fragrant purplish violet flowers starting in late June. 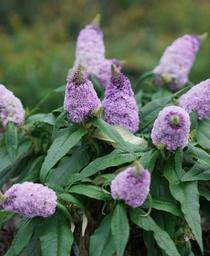 This Buddleia has a vigorous and large habit, and blooms all summer into fall. 'Miss Molly' Butterfly Bush starts blooming in July and continues all summer without deadheading. The fragrant flowers are pinkish rub red and plentiful. Buddleia davidii 'Miss Molly' is a midsized Butterfly Bush, so it works well in the back of perennial beds as well as a low hedge. Butterflies and hummingbirds consume the nectar all summer. Another beauty from Dr Dennis Werner of NC State, who crossed 'Miss Ruby' with 'Attraction' to produce 'Miss Molly'. 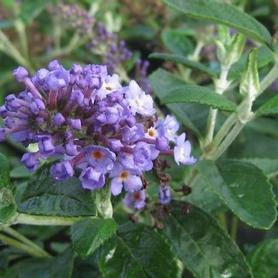 Flutterby Petite® 'Blue Heaven' ('Podaras #8') Butterfly Bush is a new introduction to the groundcover Buddleia world, with blue fragrant flowers all summer over low growing silvery foliage. It is largely sterile, and is a great nectar source for hummingbirds, butterflies and other insects. A Ball Ornamentals introduction from hybridizing work by Peter Podaras. Pugster® 'Amethyst' ('SMNBDL') Butterfly Bush is a more cold tolerant compact Buddleia, with large lavender purple blooms on short sturdy stems. Pugster® 'Amethyst' starts blooming in June and keeps on flowering until early fall. A Spring Meadows introduction, this Buddleia is recommended for use in rock gardens, perennial beds and tighter sites than most Buddleia can handle. As many of you are already aware, the threat of Boxwood Blight is increasing in our area. At PRN, we are taking additional steps to provide healthy Boxwoods. 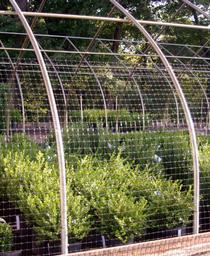 First, we only source from growers who can provide Boxwood Compliance Certificates. Additionally, we are limiting access to our Boxwoods at the nursery. This is being done to reduce the risk of spreading the disease to healthy plants. Boxwood Blight is often transmitted through spores carried on shoes and clothing, and resistant but healthy Boxwoods have been shown to carry the disease as well. Customers will be able to view and order Boxwoods from PRN but they will be a “PRN Pull Only”. 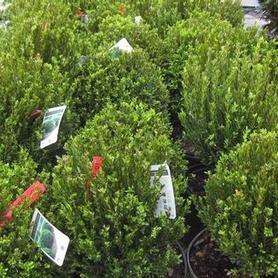 These extra precautions will keep PRN clean from Boxwood Blight so you can feel reassured that you are purchasing healthy, disease free Boxwoods which will thrive at your job site. Often called 'Tru Spreader', 'Jim Stauffer' Little Leaf Boxwood is a slow, low growing evergreen which exhibits good winter color and great cold tolerance. 'Little Missy' Little Leaf Boxwood is an excellent substitute for Buxus 'Justin Brouwers' is areas where Boxwood Blight is increasingly a problem. The Buxus microphylla cultivars are much more resistant to the effects of the blight, and 'Little Missy', with it's compact mounding habit and diminutive size works well where really small Boxwoods are needed. 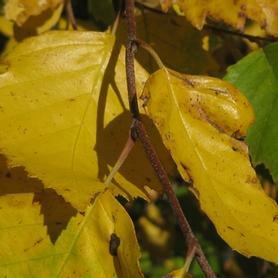 The leaves are lustrous dark green and tolerate sun well. Buxus 'Little Missy' does well with trimming, so it can be used to make knot gardens and short formal hedges. 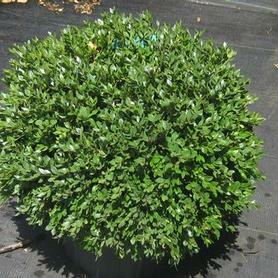 'Winter Gem' Little Leaf Boxwood has large glossy evergreen leaves with bronze backs and an upright rounded habit. Winter color is a bronzy green. 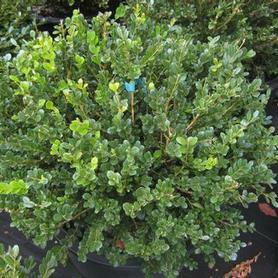 'Wintergreen' Little Leaf Boxwood has dark evergreen leaves and maintains its green winter color well. It has a rounded habit and is very hardy. Introduced by Scarff Nursery of Ohio. 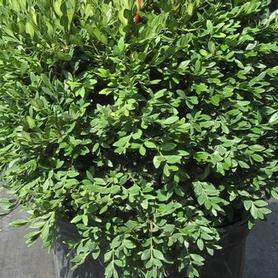 'Dee Runk' Common Boxwood has glossy dark green foliage that makes its conical shape a standout. 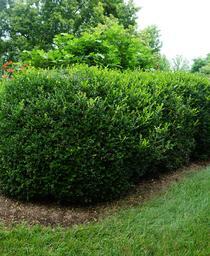 It is evergreen, disease resistant and slow growing and is an exciting newcomer to the Boxwood scene. 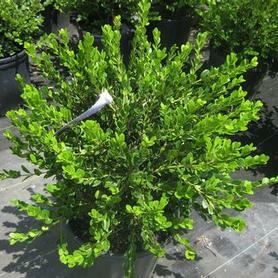 'Justin Brouwers' Boxwood has a very tight habit, with dark green foliage that maintains excellent winter color. Since it is so compact and slow growing, it needs virtually no pruning. It performs very well in short formal hedges or as a small neat specimen in rock garden settings. More sun tolerant than many Boxwood cultivars. 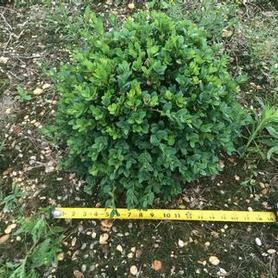 'Vardar Valley' Common Boxwood is an unusually tough Buxus sempervirens, with excellent insect and disease resistance coupled with attractive green foliage that has a distinctive bluish cast. It was found by Edgar Anderson of the Arnold Arboretum and Missouri Botanical Garden in 1945, along a river in Macedonia. After years of observation it was named and released by the Arnold Arboretum because of its proven excellence. Slow growing and compact, it forms an excellent low maintenance shrub for shady locations. 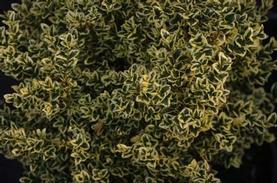 Variegata Boxwood has bright green and creamy white evergreen foliage. It brightens up a shady area and is a favorite of many gardeners. Very slow growing. A cross between B. sinica var. insularis and B. sempervirens, 'Green Gem' Boxwood is a slow growing round evergreen that combines excellent hardiness with good winter color. An introduction by Sheridan Nurseries of Ontario, Canada. 'Green Mountain' Little Leaf Boxwood has a pyramidal shape and small evergreen leaves that show some bronzing in winter. Buxus x 'Green Mountain' is from selections made at Sheridan Nurseries of Ontario. 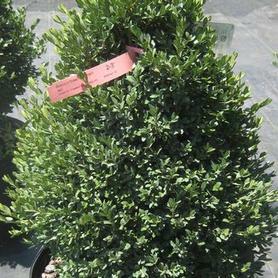 'Green Velvet' Boxwood is a very hardy selection from Sheridan Nurseries in Canada. 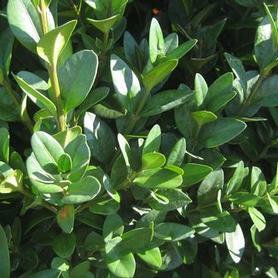 Glossy evergreen foliage on a round maintenance free shrub.